Stress stays within the body and can cause headaches, poor sleep, stomach problems and more. Spiritual Spectra offers Energy Healing which is a gentle, yet powerful healing therapy that releases stress from your body leaving you feeling relaxed. 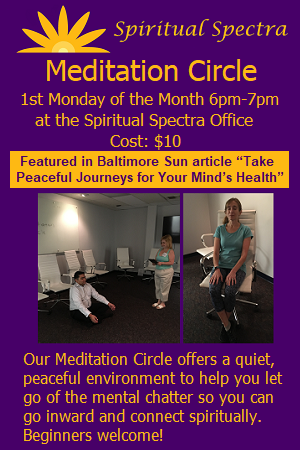 We offer Energy Healing sessions in our Maryland office. Read further down for cost and description. View this video to learn more about Energy Healing. During a treatment, the client remains fully clothed, seated in a chair or lying down on a massage table. The practitioner places her hands lightly on or just above the client’s physical body to apply the energy healing. Our method of Energy Healing was developed by our founder Jennifer Garcia, it is based on Reiki but adds an essential element to the healing process that is not used by other Energy Healing practitioners and is unique to our practice. Our method of Energy Healing also incorporates Chakra Balancing (body), Affirmation Healing (mind), and Aura Healing (spirit) to help restore you to your optimum health. Energy Healing is simple, natural and safe and all who experience it benefit from it. Receiving an Energy Healing treatment will not interfere or replace traditional medical or psychiatric care but can enhance other medical/psychiatric treatments. Energy Healing complements all other forms of holistic healing. Our founder Jennifer Garcia is a Medical Intuitive so she is able to identify areas of the body that may need Energy Healing or can advise you if further medical assistance may be necessary. For those in good health, it is advisable to receive Energy Healing at least four times a year and for those under stressful situations, it is advisable to receive treatment once a month. * The first 15-20 minutes of the appointment is for intake, learning what the client is undergoing and why they seek healing. This is important to plan a healing session that addresses the client’s needs. The remainder of the appointment is the application of the Energy Healing. Choose the Energy Healing Session that is right for you. Clients can choose to pay in advance by clicking the above link or on the day of the appointment. Please visit our Frequently Asked Questions page prior to scheduling your appointment for answers to method of payment, and more. Contact us to schedule your session. Energy Healing can also be offered for groups and events, click here for more information and pricing; and at Metaphysical/New Age/Psychic fairs and festivals. Click here for our Calendar listing of Energy Healing Session opportunities and events. Times and cost for healing sessions at fairs and festivals may vary. Being centrally located, our Energy Healing Sessions serve the following communities: Columbia, Ellicott City, Elkridge, Catonsville, Jessup, Fort Meade, Laurel, Fulton, Silver Spring, Clarksville, Highland and Olney, Maryland. Contact us to schedule an appointment today!